Members of Chug Ivri (Hebrew Club) of Berlin celebrate Purim. 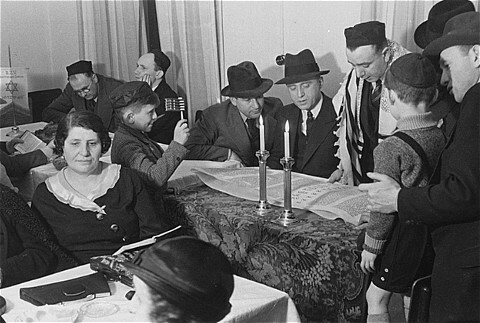 While the man in the tallis (prayer shawl) chants the story of Purim from the scroll, a young boy stands ready to use his grogger (noisemaker) to drown out the recitation of the name of Haman, the villain of the story. Berlin, Germany, 1935.